There are many different ways that humans have abused animals for their entertainment. From putting them in circuses to riding on their backs for entertainment, we have come up with countless ways to use animals for our amusement at their expense. However, it has recently been revealed that a shocking trend in China has taken this to a new level, and it’s been going on for years. That is, the trend of keeping live animals in key chains as jewelry. This is an issue that CNN reported on back in 2011, however, the trend has still been going strong ever since, and little has been done to stop it. 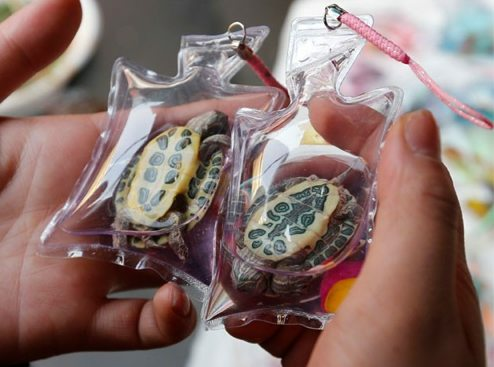 They found that small fish, turtles, and other amphibians are being sold in small, plastic pouches by street vendors while they are still alive. One of these live animal-filled pouches costs only around $1.50, and provides the animal with just barely enough room to squirm around. 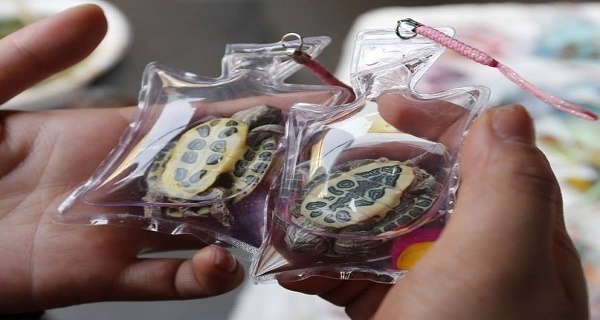 According to the vendors selling these “trinkets”, the pouches are filled with a clear or colored oxygenated water that provides the animals with nutrients. This use of animals as jewelry is not unique to China, however. Encrusting live beetles in precious jewels and wearing them as broaches is a common practice in Mexico. Wearers then attach these live beetles to their clothing using either chains or clothespins.